This piece is made from this yarn, while 100% acrylic, it looks like wool roving when woven. It has a little more sheen to it, but it feels luxurious. The fringe is made from thrifted yarns, the blush velvety yarn is chenille. The center features a scrap of trim woven and twisted. I LOVE how this one turned out and plan to use more trim in future weavings. Is it totally weird that this piece makes me think of macaroni and cheese? Because it does. All of these fibers are thrifted except for the wool roving, which is from Takufiber. In this weaving, I focused more on weaving with multiple strands of yarn instead of using a think yarn, trim, rope, or roving. All of the roving I use unless noted otherwise is from Takufiber. The fringe is all thrifted. You can see a little bit of the blush chenille in the weaving above. I love this pom-pom yarn. I'm pretty sure it's for making baby blankets and don't see it sold in stores very often, so if you see it second-hand you should snag it! 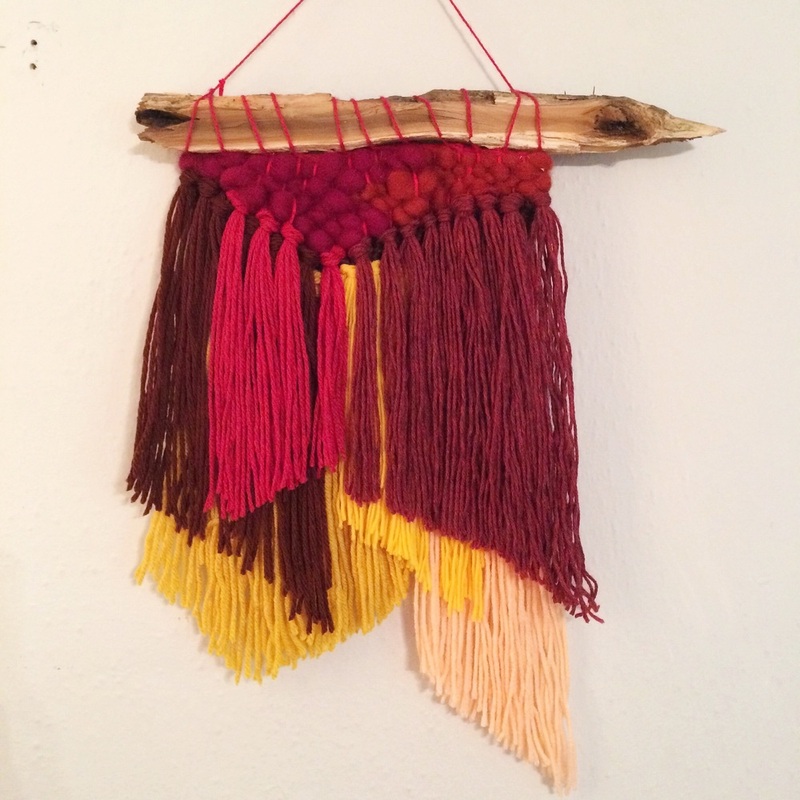 For this wall hanging I used wool roving and thrifted yarn for the fringe to create a color blocked gradient. 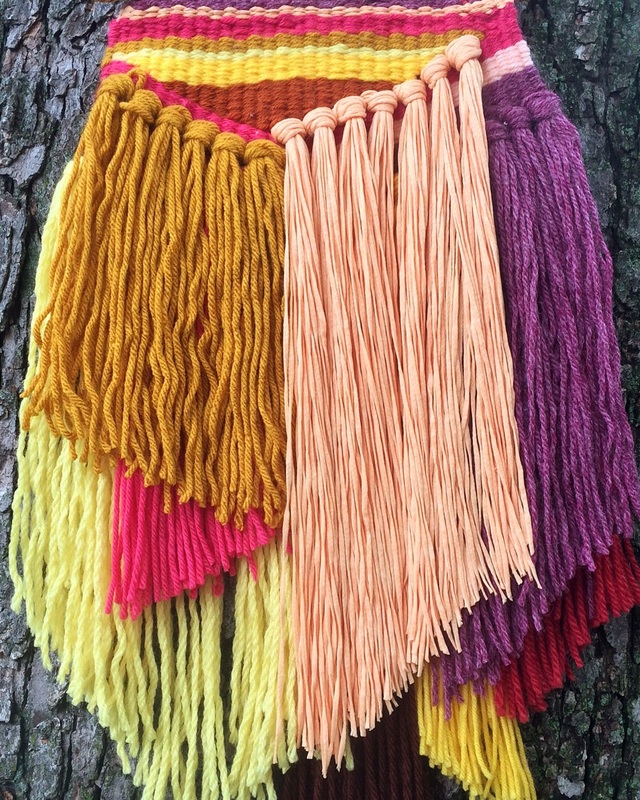 Using jewel tones, I combined wool roving and multiple strands of yarn to create thick textures throughout. The fringe on this piece is cut at an asymetrical angle. I call this piece "Neopolitan". Recent work / how is it already December? My take on Maryanne Moodie's cushion from her book "On the Loom"
I followed the pattern for making the cushion and *magically* found the perfect foot stool (Goodwill for $1.99) to use the next day. The only thing it needed was a little gold spray paint! Materials to attach the cushion and alter the foot stool: cotton yarn, gold spray paint, and painters tape. I taped the legs off so that just the base of each leg was painted. Following the steps in the book, I flipped the woven mat upside down and set the stool on top. I cut one long piece of yarn and tied it to one of the loops from the warp. Then, with a yarn needle, I pulled the yarn taught and went through the loop immediately across from it. You follow this process until you have gone through each of the loops and secure the end with one final knot. Super fuzzy and so soft. After I had finished the foot stool, the wall hanging that was hung up looked wrong. I found this macrame/ weaving on the side of the road a few months ago and hadn't decided whether to dismantle it, add to it, or keep it the same. The color pallet didn't feel like me and since it is a huge piece that you see when you enter the house, I needed it to feel cohesive. I took out a lot of the old, dark, GROSS feeling yarn and I added a bunch of roving and new fibers to this piece and am really happy with it so far (it's only been 20 minutes, so we'll see!). 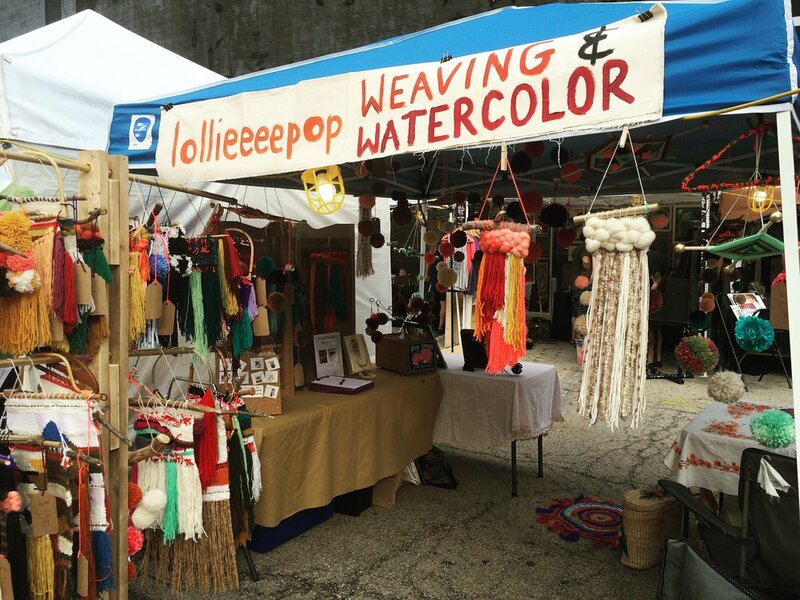 Thank you to everyone who came out to Made Fest this year! It was truly a magical weekend. 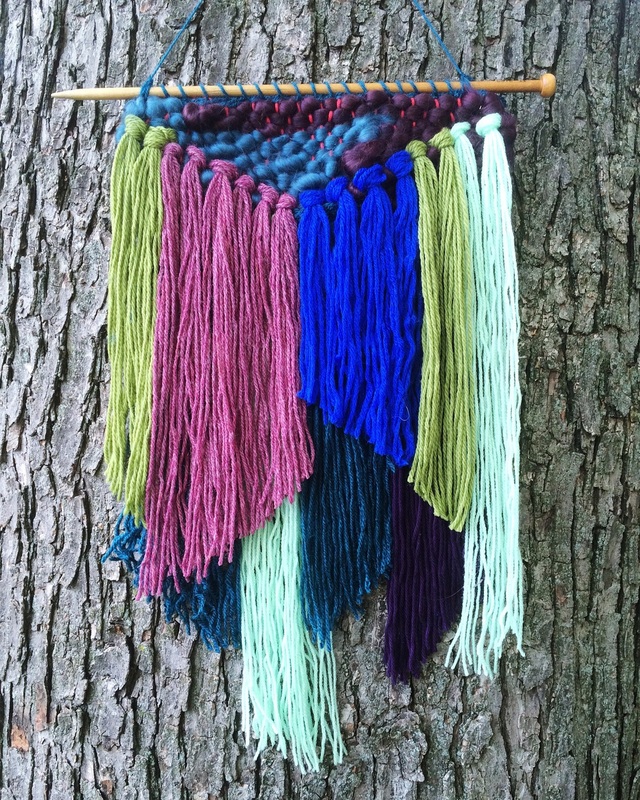 I have been making a lot of weavings in the last year and it was such a joy to watch people's faces as they touched the fringe and looked up at all of the pom-poms. Experiences like these give me encouragment to push forward. For those of you who have just discovered my work, I'm going to put some energy into photographing and updating my Etsy shop in the next few weeks. You can also check out a larger scale weaving that will be on display at Parkland College starting tomorrow, September 26th. Beginning in November, I'll have a photograph my work displayed on the MTD buses running in Champaign-Urbana and in the Illini Terminal. Dear friends, thank you for all of your support this weekend. Seeing each and every one of you was a delight! In the last few weeks I've been working on a series fringey, layered weavings. One of my main goals is to make pieces that are still somewhat sizeable, but take less time to create than my usual weavings. The faster I can make them, the cheaper I can sell them. It is so hard to price work that takes hours to create and still make them affordable. It's an ongoing process, but I'm making headway! These weavings (and many more!) will be available at The Made Fest this fall. Stay tuned for details! 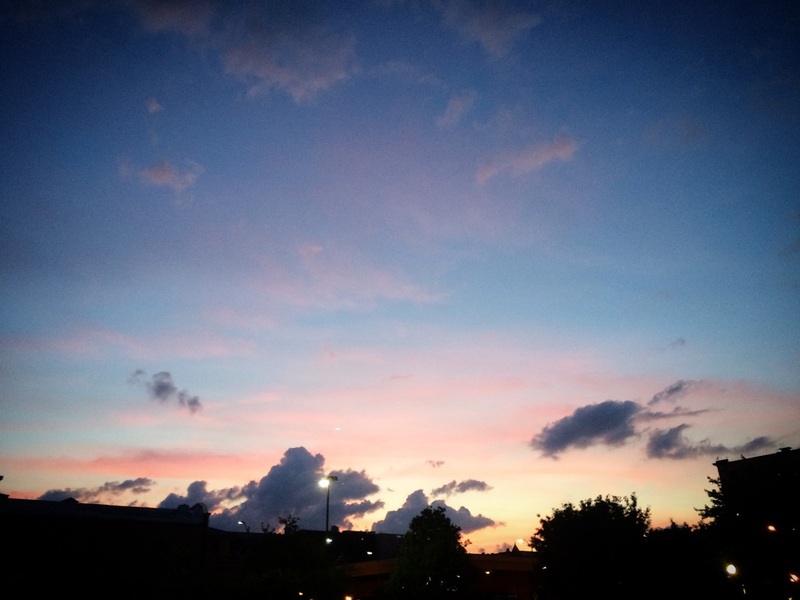 It's been months since I've had the time, energy, or inspiration to post on the blog. Life is busy! Here are some weavings! Boneyard has a now website... and I'm on it! Check out all of the fabulous artists this year. Please come by and celebrate my LAST weekend at the Lincoln building and my only show of the year! Haa! I'll be there Friday, April 8th from 5-9p and Saturday, April 10th from 12-5p. Excitingly, I sold my first piece of art on Etsy to a complete stranger yesterday. This big beauty is on her way to Portland! I was hoping to get to show it this year for the festival, but I'm super excited that my biggest weaving sold. It is inspiring my to get started on my next large piece. Hey, people! I've started another series of pom-pom wall hangings/ mobiles that will be for sale VERY soon! I'll also be selling them at Boneyard Arts Festival this year in April. Recently, I've gotten two additional jobs and have been working a lot more, leaving less time for creating. It's also winter here, which always slows me down. I'm hoping to pick back up here soon and whip out a bunch of these wall hangings. More information soon when they are for sale! More pieces - having fun with color! I bought these amazing pom-pom makers and my life is forever changed. I'm obsessed. Cool colors hung on a large wooden knitting needle. Warm colors hung on a gold painted tree branch. This bad boy took a handful of hours. By handful I mean maybe 12? I'm not totally sure. The majority was done in one day where I treated it like my job. I took a lunch break and a few small breaks, but otherwise I was workin' 9-5ish. It felt really good to force myself to weave. Most of this time I stayed away from TV and devoted myself to working (which is different than how I've been weaving lately). Often I find myself buried in yarn on the couch in front of Gilmore Girls or The X-Files, so it was a nice change of pace. Hopefully I'll have another large piece done in the next month or so. I have a lot of weaving goals to complete in the next few months including anther large piece, ten small variations of this same style, another circular rug (more details soon! 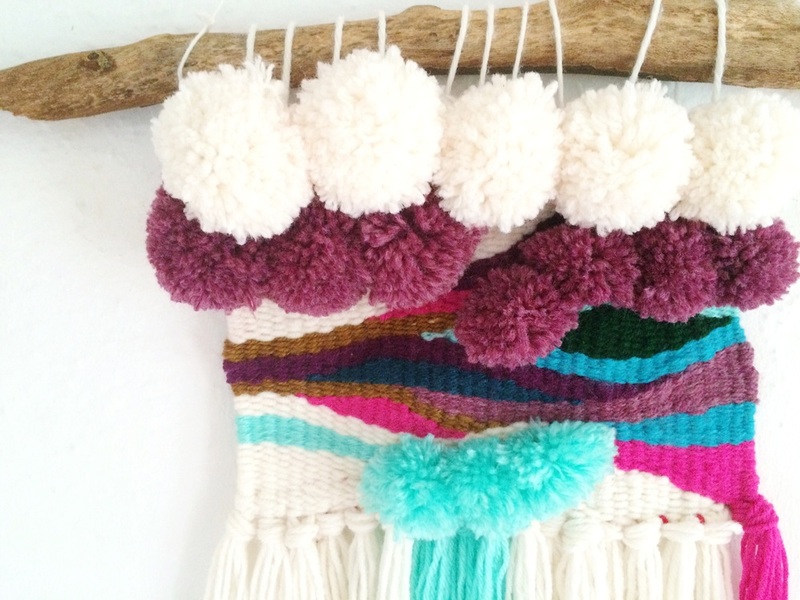 ), and some of these fun pom-pom weavings! I love to lay out the process photos of weavings---especially the big ones! "For my birthday one year I received a box of craft supplies. It was a plastic tub with a blue lid full of ribbons and thread, fabric scraps, tacky glue and Popsicle sticks, needles and a tomato full of straight pins. I grew up sewing and creating tiny furniture for my doll house. I made as much as I possibly could. My sisters and I spent our afternoons with our mother, drawing faces and creating story lines on top of the dining room table crafted out of a chicken coop door in an old farmhouse remolded by my father. Creativity surrounded us. We lived in a house with hand-stained beams and walls build with one man's hands while wearing dresses made by my mother. It sounds like a different decade, like Little House On the Prairie (I loved those books, by the way). Like any child I wanted to spend time watching movies and talking to my friends on the phone. I went through phases where I loved the outdoors and phases where I wanted nothing to do with the buzzing environment. Regardless, though, I wanted to create. I needed to. I give props to the American Girls for teaching me about the power of women and to be myself. No to mention the numerous how-to books I begged my mother to buy me from the bookstore. They taught me to make friendship bracelets, build small furniture, sew clothing, and to be confident. My memory of creating gaps and the next thing I remember is Jr. High art class, lasting only a few months. I was in 8th grade and knew that this was the only class I wanted to take in high school. The art teacher had her nose pierced and knew about color. I remember thinking I loved the smell of the classroom: the paints, the kiln, drawing paper---all of it. I didn't know then, but I'd spend countless hours in this classroom over the next 4.5 years. I grew from this timid girl who practiced drawing eyes and doodling in the margins of her notes, to an accomplished artist." I found this snipit of writing in my email. It's a new year, a new chapter. I know I won't be able to and don't want to stop making, but I'm ready to re-evaluate my creative path again. What do I want out of 2016? It's the time of year where we make lists and goals and spend our winter afternoons dreamin' about sunshine and yearning for growth. I don't make resolutions because they are built to be broken. Instead I reflect on what I accomplished this year and how to build off of those accomplishments. It's time to reinvest in teaching painting lessons. I need to advertise and bring in students again. 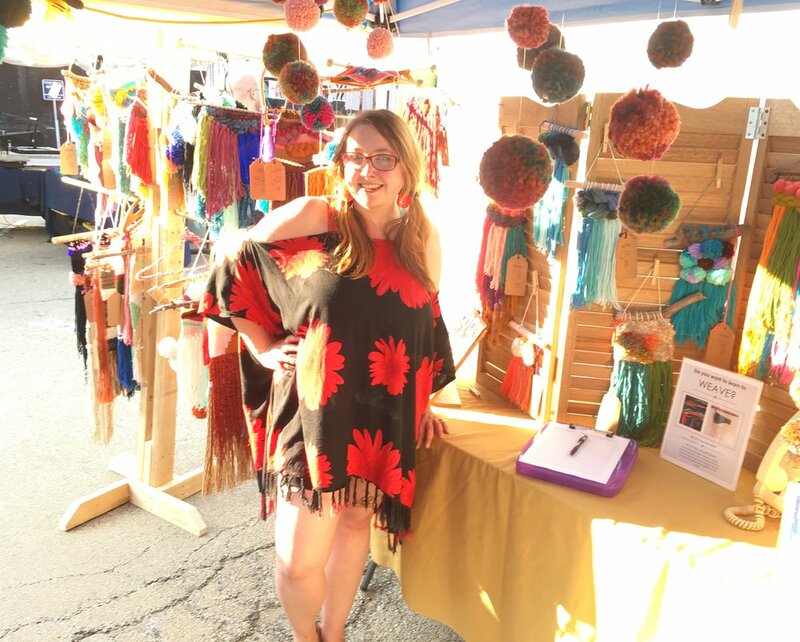 It's time to start thinking of what to display for Boneyard Art Festival this year. It's time to decide what I'm going to pursue. It's time to start preparing to leave Champaign-Urbana (if I decide to). This could be the biggest and best year of my life if I want it to.